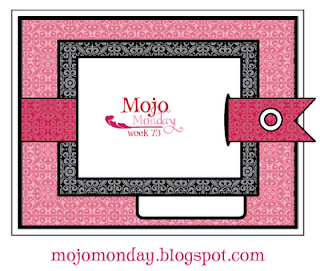 So I decided to do another Mojo Monday sketch (above). I quite liked the look of this one and thought it would fit in with the horizontal image I was using to make my friend another wedding card! My Mum wanted me to make one to give to my friend so here it is! The stamp is Lili of the Valley coloured in with copics and highlighted with Crystal and Gold Stickles. I used a Basic Grey paper for the background which I mounted onto green cardstock. The image I cut round using rectangle nesties and mounted onto a matching Basic Grey paper and then matching green cardstock. The sentiment is Lili of the Valley from their wedding sentiment collection and the flowers and fabric brad are from Poppicrafts. The ribbon is recycled. This is very pretty. Great image and great papers. Really lovely Steph, love the colours and the image is fab.